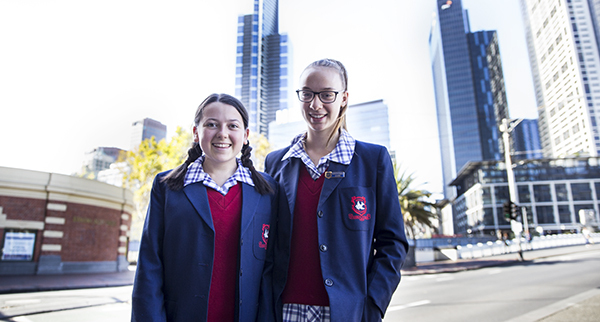 For three weeks our Year 9 students were based in Melbourne’s CBD at the City Cite campus. Their regular school days and classrooms have been substituted for early morning train commutes and an office based working environment as they navigate themselves independently all over the CBD. In my opinion, it is honestly one of the richest and most significant experiences we offer our students during their Senior School years. Kirmin’s beautiful reflection is echoed by many of her classmates as our Year 9s come face to face with people and issues that are not part of their everyday lives. It is one thing to hear about the people who are homeless on the news, it is a completely different thing to look into the eyes of someone who has just spent the night sleeping on the footpath as you wait to cross an intersection. My hope is that these types of thoughts and experiences stay in the hearts of our students as they begin to work out individually where they belong in the world. And that they become motivated to be someone who does make a positive change in their own world. The program of City Cite is designed to complement and educate each student in what they are seeing during their time in the city. This week, each Home Group has taken a guided tour of laneways and discussed substance abuse with a group from Collins St Baptist, visited the Big Issue magazine and heard from a vendor about their own life experiences and spent a morning preparing meals that were distributed to welfare and aid organisations. This is alongside visits to State Parliament and the Magistrates Court to see the process of the law, a tour of Melbourne’s iconic laneways to observe artwork and the project work that they complete in small groups. Next week, the last week of City Cite, we are looking forward to seeing how the Big Question projects come together and what perspectives and conclusions are drawn from the research, interviews and surveys. City Cite will culminate in a wonderful night of presentations next Thursday as we welcome all of the Year 9 families into the CBD campus to share in the stories and work of their children from the past three weeks.